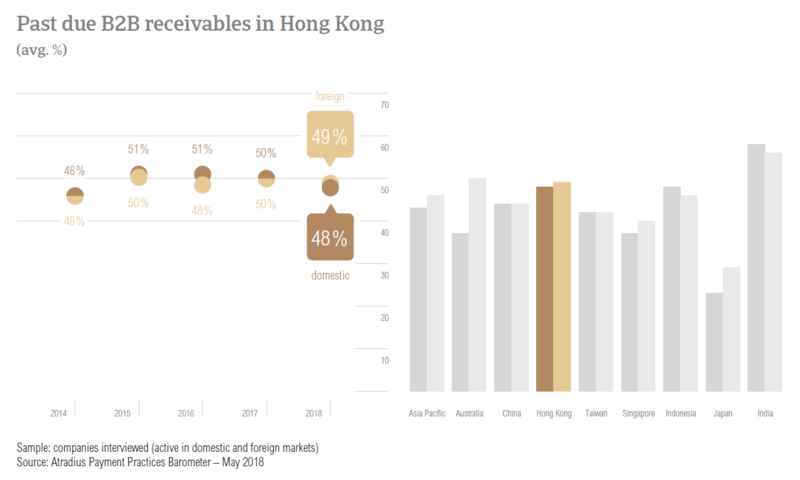 Despite improvements, the proportion of overdue B2B invoices and that of uncollectable B2B receivables in Hong Kong remain some of the highest in Asia Pacific. Suppliers in Hong Kong perceive credit sales as an easy and convenient way to nurture long-term cooperation and expand business domestically and internationally. Despite reporting improvements this year, the proportion of overdue B2B invoices and the total proportion of uncollectable B2B receivables remain some of the highest in Asia Pacific. Respondents in Hong Kong reduced their sales made on credit from an average of 50.3% in 2017 to 46.1% this year. Like their peers in the rest of the Asia Pacific countries surveyed, suppliers here also used credit in a higher proportion of sales to domestic B2B customers (on average, 48.3%) than to B2B customers abroad (43.8%). Most respondents in Hong Kong mentioned that they use credit sales to develop their companies locally and nurture their current business relationships. There is also a shared belief that selling on credit domestically is easier and more convenient. When lacking information on the customer’s business and payment performance (mentioned by 75.0% of respondents), when the buyer’s payment behaviour is poor (25.0%) or when the economic or political risk is high (25.0%), respondents in Hong Kong refrain from granting trade credit to their domestic B2B customers. Trading on credit helps us stabilize and expand our business. Companies in Hong Kong mentioned that their decision to grant trade credit is motivated by the same reasons - to boost business internationally and encourage cooperation. Ease and convenience have also been mentioned in regards to trading on credit with B2B customers abroad. The main reasons why suppliers in Hong Kong would refuse to grant trade credit to foreign B2B customers are: a lack of information on the customer’s business and payment performance (mentioned by 57.1% of respondents) and high economic and political risk in the customer’s country (mentioned by 28.6% of respondents). Credit sales bring great potential for development. In 2018, a slightly decreased percentage of respondents in Hong Kong (87.1%) reported frequent late payments by their B2B customers. This compares to 89.6% of respondents in 2017. After rising only 0.6 percentage points in 2017 to 50.2%, the proportion of overdue B2B invoices decreased to 47.7% this year. 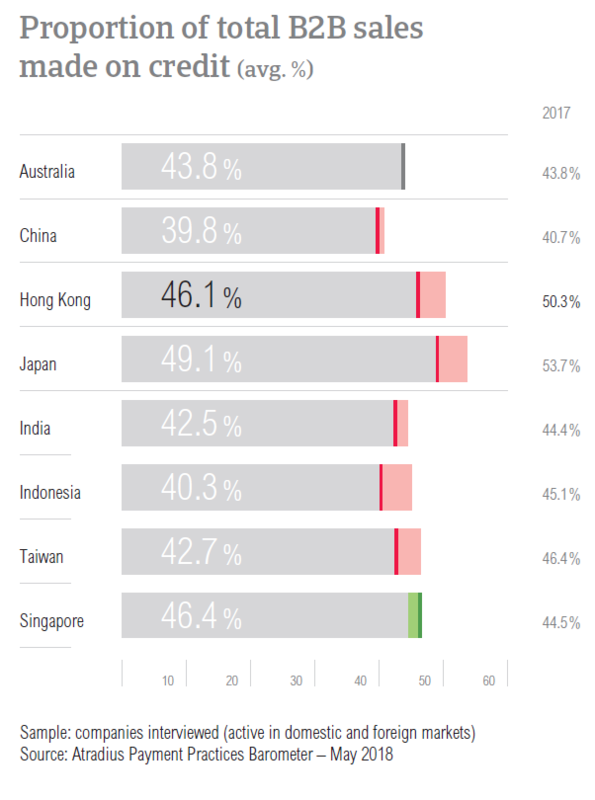 Despite the minor improvement, this is the second highest level of overdue B2B invoices in Asia Pacific after that recorded in India (56.7%). The average Days Sales Outstanding (DSO) figure in Hong Kong is 35 days, one day shorter than in 2017 and at the same level as it was in 2016. It is also five days shorter than the regional average. Most respondents in Hong Kong (60.3%) do not expect their company’s DSO to change over the coming 12 months. Of those expecting a change, 18% said that they foresee a slight increase and 11.3% a slight decrease. Similarly to what was observed in 2017, the average payment terms in Hong Kong are in line with the regional average. In 2018, respondents in the country are giving their B2B customers two days longer to pay their invoices. Domestic B2B customers are asked to pay their invoices, on average, within 32 days while foreign B2B customers within 33 days. 61% of respondents in Hong Kong said that they are most likely to differentiate payment terms between domestic and foreign B2B customers. 39% said that they are likely to set shorter payment terms for their domestic B2B customers, while 22% said that they would ask their foreign B2B customers to pay faster. Reasons such as internal policies, industry practices and the economic situation seem to influence this decision. In 2018, respondents in Hong Kong reported longer payment delays by their B2B customers. An increase of two days was reported in respect to domestic B2B customers (on average, 26 days) and a one day increase in regards to foreign B2B customers (on average, 23 days). These increases together with the changes in payment terms have resulted in a rise in the average payment duration. This is three days longer than in 2017, at 57 days on average. 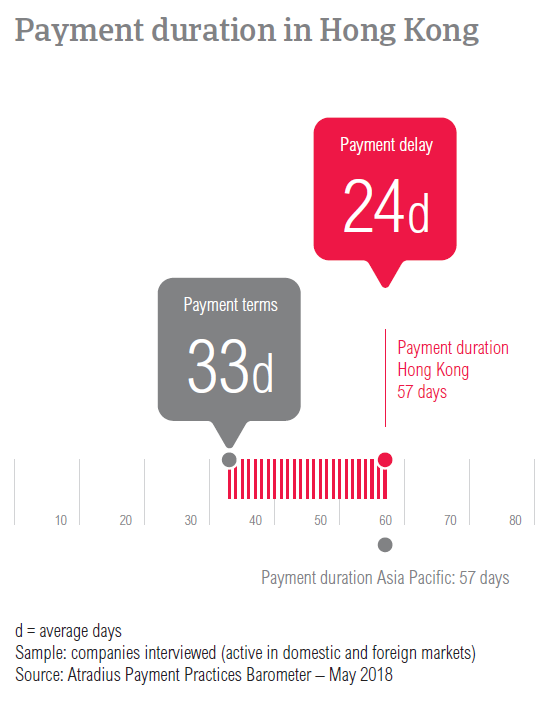 Suppliers in Hong Kong (54.2%) said that domestic payment delays occur most often because of insufficient availability of funds and the complexity of the payment procedure (36.4%). Both percentages reported in the country are significantly higher than the regional averages. The complexity of the payment procedure and disputes over the quality of the goods delivered or services provided were the main reason for payment delays by foreign B2B customers. These were reported by 40% and 37.4% of respondents respectively. To manage the impact of overdue B2B invoices, 24% of respondents had to postpone payments to their own suppliers, 21.3% needed to pursue additional financing and 21.3% to request a bank overdraft extension. 15.9% of respondents mentioned that payment delays led to revenue loss. The majority of respondents in Hong Kong (53.3%) said that they are already using e-invoicing with their B2B customers. Compared to other countries surveyed in Asia Pacific, this is one of the lower percentages. 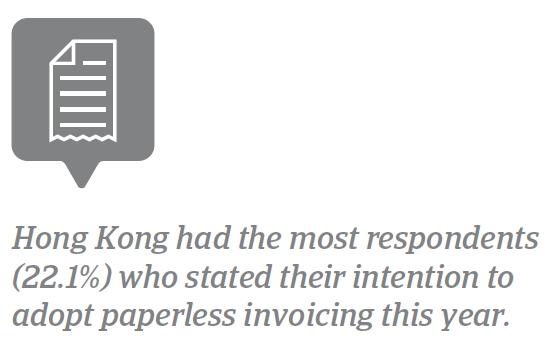 However, Hong Kong had the most respondents (22.1%) who stated their intention to adopt paperless invoicing this year. In contrast, 20.6% expressed their lack of interest in e-invoicing and 4.0% said that they are no longer using this. Despite it not being reflected in the findings above, respondents in Hong Kong believe that electronic invoices impact payment duration positively. 61.5% of respondents mentioned that they received payments quicker and only 4.8% that they experienced a slowdown. According to 33.8% of respondents, e-invoicing had no noteworthy effect. Asked whether they are expecting any turnover losses due to trade uncertainty and protectionist measures, 35% of respondents said that they do not foresee an effect on their businesses. Of those who believe that their companies will be affected by global developments, 22% foresee an impact on turnover of up to 10% and 21% that the impact will be between 10% and 20%. 11% believe that the impact on their business’s turnover will be more significant, between 20% and 30%. Only 3% of respondents believe that trade uncertainty and protectionist measures across the world will impact their business’s turnover positively. B2B receivables were written off as uncollectable less often than in 2017, dropping the total proportion of uncollectable receivables from 2.4% to 2.1% this year. Despite the decrease, Hong Kong had the second highest proportion of B2B receivables written off as uncollectable. Only India had a higher percentage. Uncollectable receivables originated most often from B2B customers in construction, consumer durables, business services and services. 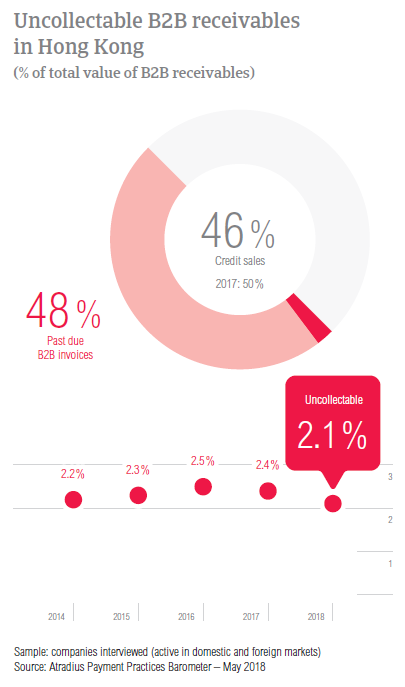 The main reasons for writing off B2B receivables as uncollectable are the customer going bankrupt or out of business (mentioned by 46.5% of respondents), the inability to locate the customer (40.3%) and the failure of collection attempts (35.7%). Payment terms given to B2B customers in the textiles (44 days) and electronics (36 days) sectors exceed the 33 day average for Hong Kong overall. In contrast, B2B customers in the paper sector had some of the shortest average payment terms (18 days). Suppliers in Hong Kong reported that B2B customers in the food and business services sectors generated some of the longest payment delays, on average 29 days. 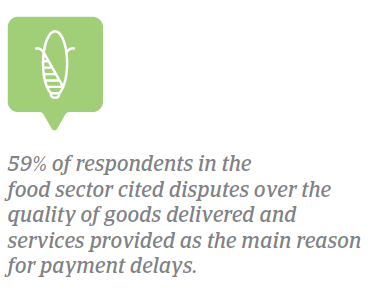 The most frequently reported reasons for payment delays in the food sector are disputes over the quality of goods delivered or services provided (59%) and the inefficiencies of the banking system (47%). Suppliers reported that payment delays from B2B customers in business services occurred mainly because of insufficient availability of funds (38%), the complexity of the payment procedure and due to disputes over the quality of goods delivered and services provided (each reason mentioned by 35% of respondents). When asked if they expect their B2B customers’ payment behaviour to change over the coming 12 months, 38% of respondents said that they do not expect any changes in the food sector. 41% however, seem to expect a slight deterioration in the payment behaviour of their B2B customers in the food sector and 14% a slight improvement. Suppliers in business services are more optimistic about the coming 12 months, 58% do not expect changes in payment behaviour and 21% foresee a small improvement.